Battery Check .. 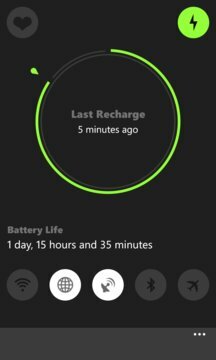 The perfect app to better manage the battery life of your Windows Phone! From the simple graphics but at the same time attractive, Battery Check will start in less than 1 second and in a few gestures you can change the settings according to your tastes and needs. You want to be notified when the battery is low? In the settings section you can choose the threshold of the battery and will provide a notice to warn you. Battery Check the app faster and spectacular ever created .. For you FREE. Try it!